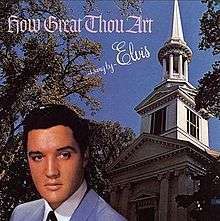 How Great Thou Art is the twenty-eighth studio album by Elvis Presley, released by RCA Victor in mono and stereo in February 1967. Recording sessions took place at RCA Studio B in Nashville, Tennessee, on May 25, 26, 27, and 28, 1966. It peaked at No. 18 on the Top Pop Albums chart. It was certified Gold on February 16, 1968, Platinum and 2x Platinum on March 27, 1992 and 3x Platinum on October 13, 2010 by the RIAA. The title song won the 1967 Grammy Award for Best Sacred Performance. Twelve tracks were completed for the album, including the standards "In the Garden" from 1912 popularized by Billy Sunday and "Run On" from the jubilee tradition. The 13th track, "Crying in the Chapel," had been recorded during the sessions for His Hand in Mine and released as a single in 1965. The sessions also produced the single "Love Letters", two b-sides, and two additional songs that would be added to the Spinout album. The Christmas single would be completed, a composition by Memphis Mafia mainstay Red West "If Every Day Was Like Christmas", at the next session on June 10. In 2008, Sony Music reissued for compact disc a remastered version of the album with three bonus tracks. Two had been released as a single in 1968, the hit side Presley's stab at "You'll Never Walk Alone" from Carousel barely making the Billboard Hot 100, with the third track a leftover from the sessions at American Sound Studio in 1969 and issued on a budget album in 1971. The album was re-released in 2010 on the Follow That Dream label as a two-disc set with outtakes. "Crying in the Chapel" was released as a single (RCA 47-0643) on April 6, 1965 and reached number 3 on Billboard's Hot 100 chart. "You'll Never Walk Alone" was released as a single (RCA 47-9600) in March 1968 and reached position 90. Its B-side is "We Call On Him". 3. "Somebody Bigger Than You And I"
8. "Where Could I Go But To The Lord"
10. "If The Lord Wasn't Walking By My Side"
12. "Where No One Stands Alone"
13. "Crying In The Chapel"
14. "You'll Never Walk Alone"
15. "We Call On Him"
16. "If Everyday Was Like Christmas"
Carl Boberg, author of the Swedish poem "O Store Gud"
↑ Simpson, Paul (2004). The Rough Guide to Elvis. London: Rough Guides. p. 129. ISBN 1-84353-417-7. ↑ Lichter, Paul (1978). The Boy Who Dared To Rock: The Definitive Elvis. Garden City, NJ: Doubleday. pp. 167,175. ISBN 0-385-12636-0. 1 2 3 4 5 6 7 8 9 10 11 12 Jorgensen, Ernst. Elvis Presley A Life in Music: The Complete Recording Sessions. New York: St. Martin's Press, 1998; pp. 203-420. ↑ "Sandwich Massachusetts for Couples". Cape Cod for Couples. 2011. Retrieved September 29, 2011. "How Great Thou Art". Elvispresleyshop. Elvis Australia. 2015. Retrieved January 25, 2015.